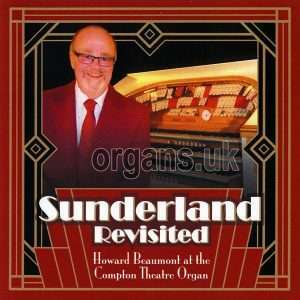 View basket “Howard Beaumont – Sunderland Revisited (2019)” has been added to your basket. 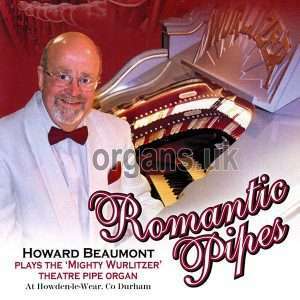 This brand new CD from Howard Beaumont boasts a stellar list of organs and keyboards. On the organ side of things there is a Roland Atelier 80SL, a Roland 350c combo, a Kawai SR6 and a Hammond A100 (with Leslie 122 speaker). You can also add a Roland FP80 digital piano and a Yamaha S950 keyboard to the mix. Howard’s last CD was “Moonglow” released in late 2014, this was a compilation from his six “As Time Goes By” CDs with John Taylor on piano (plus three new tracks). 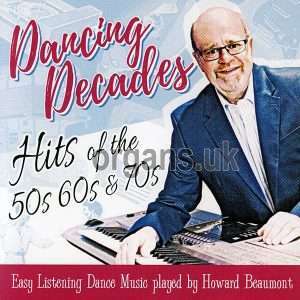 Earlier that year he also released “Organised Dance Time” which was a sequence dance CD with a similar keyboard line-up. As Howard mentions in the the sleeve notes, this CD marks a special anniversary as 2016 is his fiftieth anniversary as a professional organist and pianist. The notes also mention his time playing aboard cruise liners in the early 1970s and a long part of his career playing in the Scarborough Spa Suncourt (his twenty-five seasons were marked with his 2012 release “That’s Amoré”). Now, onto the music on the CD and I am pleased to say this is a lovely recording to mark a milestone as the tune selection, playing and sound is excellent. There are plenty of highlights including Randy Newman’s theme to the Toy Story movies, “You’ve Got a Friend in Me” with its laid back organ and acoustic guitar leads. Another great track is a lovely theatre organ recreation of Doris Day’s “Secret Love” and talking of recreations, we have a plucky version of David Rose and His Orchestra’s “Holiday for Strings” with it’s recognisable pizzicato strings mixed with theatre organ. There is also a fabulous theatre organ version of “Beautiful Dreamer” with the opening church bells. The first solo piano track is “Make You Feel My Love” which was made famous by pop superstar Adele on her first album “19”. The song was written by Bob Dylan in the late 1990s, although it was first released by Billy Joel in 1997, two months before Dylan released it himself. This is a lovely version of a lovely song with just an addition of some orchestral strings at the end to give it a little lift (if that were needed). The second of the solo piano pieces is the timeless “Bridge Over Troubled Water” which also has a light strings backing at the end. Two more tracks could also be added to the piano ‘set’; The “Fly Me to the Moon” and “Moon River” medley with its piano lead over theatre organ backing and “All the Way’ and “For Sentimental Reasons”, although this does have some vibes in the melody and organ backing. 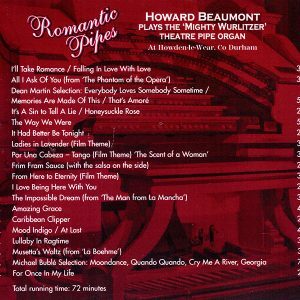 The classical side of Howard’s playing is dealt with in the shape of “The Arcadian Overture” and an orchestra-full “Strauss & Co.” medley. There is also a fun Nautical Medley. Howard gets a chance to improvise a little on the swing medley of “Jersey Bounce”, “Johnson Rag” and “Cherokee” and later on with the mix of “Buona Sera” and “Mack the Knife”. There’s a very faithful 1950s Hammond style version of “Tea for Two” even down to the authentic reverb and delay effects. This is followed by a modern Hammond version of “Unforgettable” which again gives a little space for some nice improvisation. 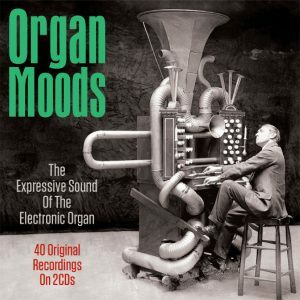 There is also a 1950s organ treatment of Fat’s Waller’s “Alligator Crawl”, made famous as an organ piece by Harold Smart. 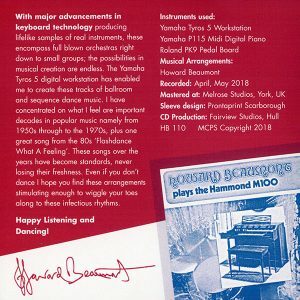 As I said, this is a great release to celebrate Howard’s half-a-century as a pro musician and shows just what he can do in a variety of styles. FULL TRACKS: Wonderful Wonderful / Romeo • You’ve Got a Friend in Me • Secret Love • Holiday for Strings • Make You Feel My Love • Beautiful Dreamer • Nautical Medley: Barnacle Bill / Drunken Sailor / Portsmouth / Life on the Ocean Wave / Sailor’s Hornpipe / The Arethusa / Anchor’s Away • The ’Arcadian’ Overture • Big Band Medley: Jersey Bounce / Johnson Rag / Cherokee • Tea for Two • Unforgettable • All the Way / For Sentimental Reasons • Bridge Over Troubled Water • Alligator Crawl • Morning Dance • Fly Me to the Moon / Moon River • Buona Sera / Mack the Knife • Strauss & Co.: Snow Waltz / The Blue Danube / Vienna Life / The Merry Widow / Dance with Me. 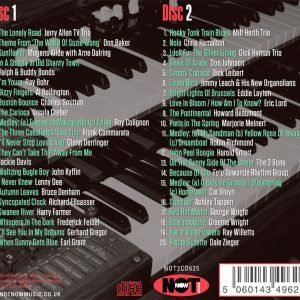 July 2018 release containing hits of the 50s, 60s & 70s at the Yamaha Tyros 5. 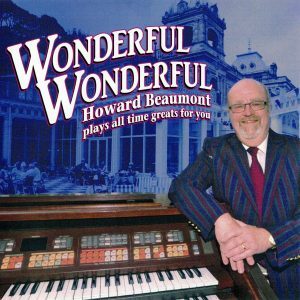 2017 release at the Wurlitzer Theatre Organ, New Victoria Centre, Howden-le-Wear. This entry was posted in OKC Reviews and tagged cd, organ, review.